Both measures would require Internet operators to police activity online, and would mandate Internet giants like Google and AOL (the parent company of The Huffington Post and an opponent of the bills) and credit card companies to take down sites that have content deemed to be in violation of copyright rules. The battle has pitted huge content generators like Disney and the motion picture industry against their online competitors, with each side reportedly spending some $90 million on lobbying efforts. Supporters say the measures will help curb theft and preserve the integrity of the Internet. Opponents charge that the measures amount to censorship that will stifle innovation and impose higher costs on consumers. 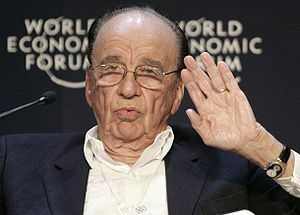 News Corp. owns 20th Century Fox films and many television franchises such as “The Simpsons.” The firm has long lobbied on the issue, donating to members on both sides of the aisle. In a bid to ‘squash negative stories’ about Barack Obama that appear on the Internet, the White House has hired a dedicated propagandist whose role will be to savage people who tell “lies” about the President, in a chilling reminder of how prosecutors threatened people with jail time during the 2008 campaign if they criticized Obama. “The Obama administration has created and staffed a new position tucked inside their communications shop for helping coordinate rapid response to unfavorable stories and fostering and improving relations with the progressive online community,” reports the Huffington Post. The man tasked with the role of “disseminating push back” against Obama’s online critics by direct order of the White House will be Jesse Lee, a blogger who has previously put out White House spin in response to claims made by Glenn Beck. 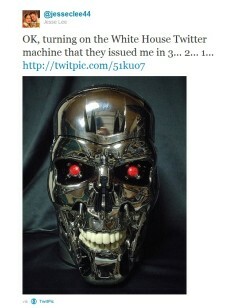 Lee’s first Tweet as an official mouthpiece for White House propaganda and the Obama administration’s move to launch an “aggressive defense of the president and his policies” gives us some indication of what we can expect – the post includes a picture of the Terminator robot. 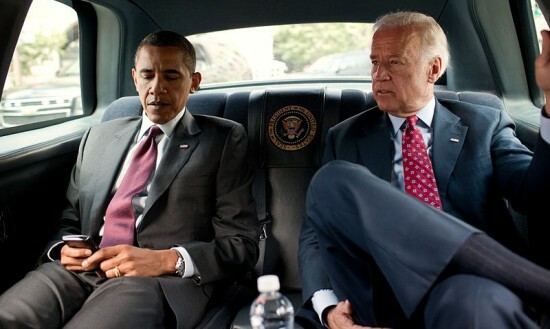 “If you’re going to post something online about Obama that isn’t true, Lee is going to be the one to handle you,” reports Chris O’Shea, noting that the move is about “squashing any negative stories” that could derail Obama’s re-election bid. Lee obviously sees himself taking the role of ‘Terminator’ in destroying ‘conspiracies’ and ‘disinformation’ about the Obama 2012 campaign, similar to how Obama-supporting prosecutors and sheriffs in Missouri threatened people with jail time for telling “lies” about Obama during the 2008 campaign. News agencies in Pennsylvania and Ohio were also sent threatening letters demanding they stop airing ads exposing Obama’s anti-gun stance. This has nothing to do with circulating “lies” about Obama, this is about intimidating, silencing and smearing anyone who dares tell the truth about Obama’s record or his highly dubious personal history. As we documented in 2008, the Obama campaign’s effort to target “lies” about the president’s record was actually a transparent bid to keep his extreme anti-second amendment record under the radar as the election neared. Not only was he on record as opposing handgun rights in Washington DC, Obama served on the board of the Joyce Foundation, probably the largest private funder of anti-gun and pro-ban groups and research in the country. In addition, Obama voted for a bill that would “expand the definition of armor piercing ammunition” and “support[ed] banning the sale of ammunition for assault weapons,” including 223 and .308 caliber bullets, the most common rifle ammunition. He supported the Illinois Firearms Owners Identification (FOID) Card, mandatory for residents when they buy any firearm in the state. Obama’s record was clearly anti-second amendment to the hilt, but to communicate this fact to the public was characterized as “lying about the campaign” by Obama’s enforcers, and was met with threats and intimidation. Expect the same thing to happen for 2012 – verifiable facts about Obama’s voting record and his stance on key issues, as well as documented examples of his deception on a myriad of different topics, will be targeted for ‘termination’ by Obama’s team of online attack dogs led by Jesse Lee. And all this from the same administration that wants to give Obama a figurative ‘kill switch’ for the Internet that would hand the President Communist Chinese-style powers to shut down parts of the Internet for “security reasons,” in other words to silence and censor legitimate political opposition to Obama’s big government agenda. Of course, this is all straight out of Cass Sunstein’s blueprint for hijacking and censoring the Internet by government regulation. Sunstein, Obama’s White House information czar, wrote a series of papers before the 2008 election in which he advocated banning or taxing “conspiracy theories,” including skepticism about man-made global warming, in addition tomandating by law that websites link to opposing information or that pop ups containing government propaganda be forcibly included on political blogs. 5% – 15% Off Select HDTVs.